Fort Wetherill is a former Coast Artillery fort that occupies the southern portion of the eastern tip of Conanicut Island, located in Jamestown, Rhode Island. The fort sits atop high granite cliffs, overlooking the entrance to Narragansett Bay. 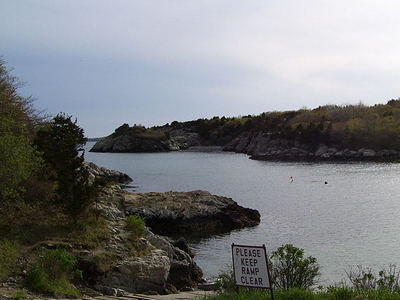 Fort Dumpling, dating from the Revolutionary War, used to occupy a small site within Fort Wetherill. The fort was deactivated and turned over to the State of Rhode Island after World War II and is now operated as Fort Wetherill State Park, a 51-acre (210,000 m2) reservation. Today the park is managed by the Rhode Island Department of Environmental Management, and offers ample parking facilities, public restrooms, trash/dog waste bags, and picnic tables. Jumping off the rocks at Fort Wetherill is prohibited, along with the consumption of alcohol. There is no enterance fee to get into the park and the park can be accessed any time between sunrise and sunset. Here's the our members favorite photos of "Forts in Jamestown". Upload your photo of Fort Wetherill!